The stone is actually pretty thick...2-3". That's probably why it appears to have more depth. No hand chiseling...I think the images on the Thorntree website do not appear as accurately as the above image. It is really rough in reality. Hope that helps. 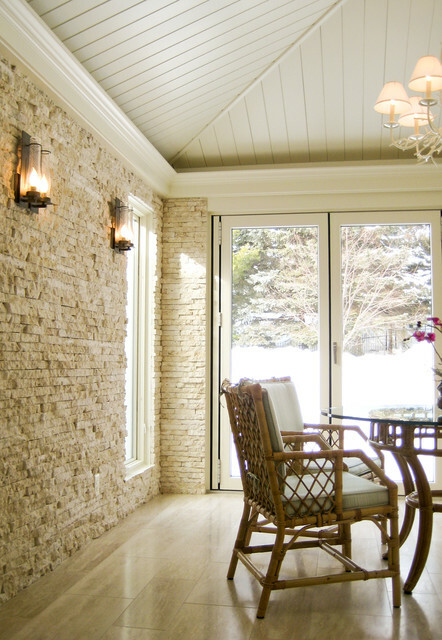 A similar, not as rough, stone panel is available from ErthCOVERINGS, it is the Sydney Yellow Rough Break stone veneer panel. Sconces - I love these sconces could you share where you bought them. Thank you! Where can i find the wall sconces? Looks like 204250 Hubbardton Forge. hi where can I buy this stone and color? looking asap...thank u.
Hi...not sure where you're located, but the wall and floor tile came from Tile X Design in Minnesota. 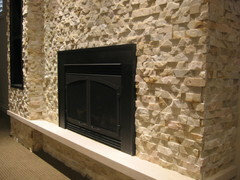 The wall tile is from Thorntree - Shellstone wall ledge cladding, and the floor tile is Durango Veracruz. Hope that helps. 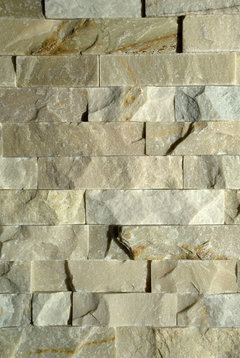 What brand, color of ledgestone, plz? - Very attractive.